The decline in prices experienced by most extractive commodities since 2011 has strained the economy and public finances of most resource-dependent countries, with implications for poverty reduction. 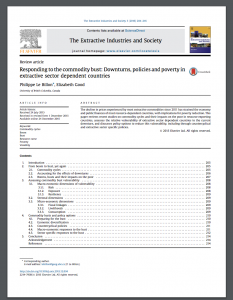 This paper reviews recent studies on commodity cycles and their impacts on the poor in resource exporting countries. It assesses the relative vulnerability of extractive sector dependent countries to the current downturn and discusses policy options to reduce this vulnerability, including through countercyclical and extractive sector specific policies.